If you tell the truth, your path gets clearer. In that moment of illumination, I knew that her statement could provide desperately needed guidance as I navigate the tricky waters in my relationship with my church. 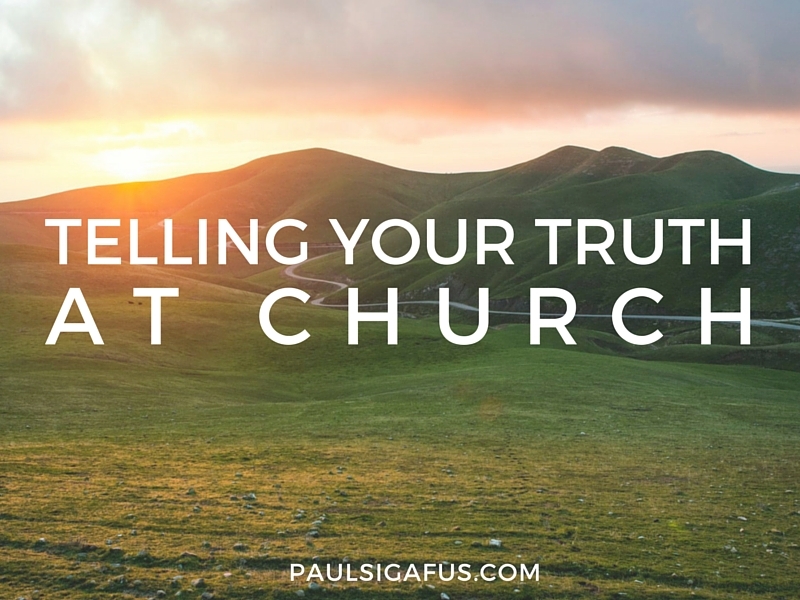 Telling the truth struck me as the only possible way for me to maintain spiritual peace as I try to find my place within my church community. If I’m to maintain my integrity (and I think that’s what God desires from me), then being honest about my experience, struggles, joys, questions, and desires is the only way forward. But telling the truth is dangerous. It’s not always safe to tell the truth. People can get really reactive when they feel afraid or challenged. If I tell the truth, I may be judged, misunderstood, and labeled. Intense feelings of tribal loyalty, emphasis on institutional authority, and a history of persecution of the church (both actual and imagined) could bring a strong backlash of fear, judgment, and defensiveness if I voice questions or express views that fall outside of the cultural norms. If I tell my truth, people who don’t know my heart might view me as incendiary, faithless, traitorous, or even “apostate” (to use the nuclear term in my church’s vernacular). If I tell the truth, I may be rejected. Like in any tribe, if I express feelings and thoughts that are too different in the church, I could be isolated and pushed to the cold periphery of the circle. My honest differences could be viewed with pity or skepticism. Ultimately, if the church perceives my honesty as breaking the rules of the tribe, I risk not only punishment and marginalization, but also expulsion. Not telling my truth is even more perilous. If I tell the truth, I may be misunderstood, judged, marginalized, or outright rejected. But if I don’t tell my truth at church, I risk suffocating and burying myself in a coffin of silence. You see, my desire isn’t just to attend church. I don’t want to go for show. I can’t force myself into a mold that doesn’t fit the contours of my own expanding soul. However correct or incorrect my views, I just can’t pretend that I always agree with things that just don’t fit for me about God and the church. I’m seeking something deeper. I want to belong. Only as I express and treat my own truths with loving acceptance can I find a place of faith that feels like home. If I’m going to have a real chance at discovering a place of belonging and communion, I have to tell my truth at church. Otherwise, I’ll never know whether I can truly belong there. Although I can’t see into my future, I hope my choice isn’t between mutually exclusive options of either (1) telling the truth and being expelled from a community I love or (2) keeping silent, pretending, and faking it just to get along. My joyful, vulnerable hope is that telling my truth at church will be understood and received as an imperfect but sincere gift from my heart: an offering of vulnerability, an act of authenticity, and an extension of trust. Thank you for sharing your thoughts. Your very comment is where I am at: “If I tell the truth, I may be judged, misunderstood, and labeled. Intense feelings of tribal loyalty, emphasis on institutional authority, and a history of persecution of the church (both actual and imagined) could bring a strong backlash of fear, judgment, and defensiveness if I voice questions or express views that fall outside of the cultural norms. If I tell my truth, people who don’t know my heart might view me as incendiary, faithless, traitorous, or even “apostate” (to use the nuclear term in my church’s vernacular)” In my church culture, conflict is avoided at all costs. So when I tell the truth as I see it, it is as if the comment existed and then was blown away on the wind. My comments are never acknowledged. After I speak, subjects are just changed in the blink of an eye, and it’s off to more jokes about the latest TV show or whatever the popular topic of the day is. I pray a lot and ask God a lot of questions about “why” this is. I know it’s not me. In my experience in the secular part of my world, I would be listened to, and folks would be more likely to acknowledge a difference of opinion and be willing to talk about it. So how is it working out for you Paul? 7 months in, do you belong? Good question, Joe. The best answer (though not entirely satisfying) is “kind of.” I love the sense of community, service, and care in my church, but there are many things that don’t fit for me. I suppose there’s no perfect faith community; my current hope is still that I’ll be able to find a healthy way to relate to this one. Thanks for asking! So here’s one of my truths: I believe the church I belong to is 64% true ;) Said in another way: I believe the church teaches many beautiful, hopeful things. I believe that as group of very fallible but mostly honest human beings, we’ve gotten some things right and some other things quite wrong. I believe that we don’t possess or comprehend all truth. I believe have a lot to learn not only from God, but also from others. Thank you for another beautiful post. I hope we all find inclusion and acceptance in our faith community. Telling the truth is a brave thing in any relationship. Not all relationships can handle that level of vulnerability. Not all people can accept others truths the way they should, with respect and compassion and an effort to understand. Our inability to accept others truths, the way the Savior accepts ours, limits our relationships. And even when we try to follow His example, our human weakness limits us sometimes. Our own self deceptions; “need to be seen as”instints; our own truths which may conflict with others’ truths; and countless other faults cause us to stumble over eachother and sometimes wound eachother in this process of honesty. Along with integrity which is essential to living with serenity; there is also required a healthy dose of forgiveness and humility. Humility to me meaning recognizing our true relationship to others and god. You express yourself well here Paul and I hope you find peace in your search for the divine. I have found amazing flashes of love and selflessness in humanity as well as devestating selfishness. We are aĺl truly fallen with divine potential. Good and bad. Change what you can change. Let go what you can not change. And pray for help to recognize the difference. I do not think it is unheathy to chose wisely those who you bare your heart to. Its a precious thing. You were a kind and sensitive young man and seem the same now from your posts. I hope you find those who will treat you the same. God will ever be that. Kindest regards to you. I am grateful to others who are so honest. The world is a better place for it. Thanks for your honesty and perspective. I think you are a fantastic part of our faith community. We’re lucky to have you!